What Should My FOURTH Adventure Be? Most people that know me well would say that I am a nerd, geek, or some other word associated with that kind of culture. And they would be spot on. Not only do I collect comic books, play tons of video games, and have a geeky tattoo, but I also absolutely love outer space. I use the word stellar as a regular adjective. I can go stare at the stars for hours on end and be inspired to have the most heart staggering conversations. I read books by Stephen Hawking for the fun of it. 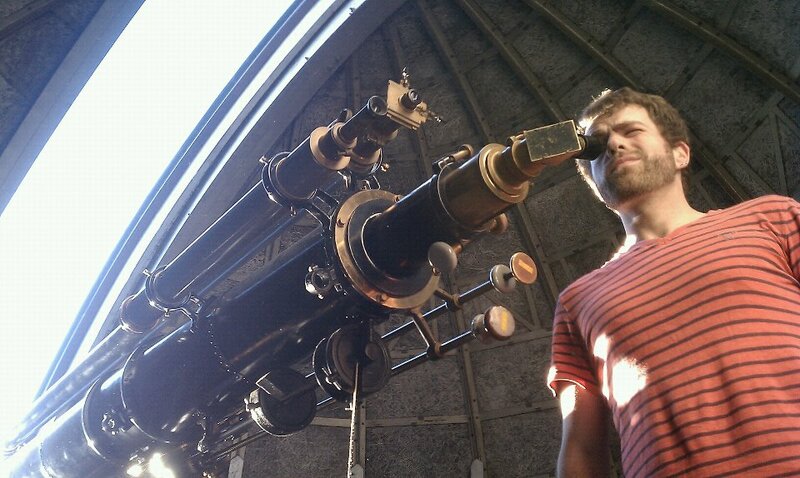 However, I can’t remember the last time I looked through a telescope. My father has a telescope, and I’m told that when I was younger, we would look through it together. But these memories are sadly lost to me. However, as I’ve discovered countless numbers of times over the years, the impression of these events with my father has stuck with me. So for my adventure, I decided to observe the Transit of Venus through one the largest telescopes available to the public in the Twin Cities, which was at the University of Minnesota. I was somehow able to convince three people to join me by saying that looking at a shadow of a planet as it crosses the sun is a fun thing to do (thanks for humoring me). And I’m glad they came along, because the event was attended by far more people than I was expecting. The line was over an hour long, and the event itself was only visible for close to three hours from our location. I won’t lie, I was kind of worried that we wouldn’t make it to the telescope in time. We were inching forward and racing the sunset. We were able to see the transit maybe twenty minutes before sunset. And though I was only able to view it for ten seconds, I was absolutely floored. When I look towards the heavens, I am so humbled. I am literally able to look back in time just by looking up. I am able to realize how I am such an infinitesimal cog in the gears of the universe. Yet, I’d like to think that I have the ability to make large, positive, and shattering contributions to my friends, my family, and the world at large. This contrast makes me feel nothing shy of giddy. This is for those of you who want to get e-mails updates from this site so you don't need to check it regularly. For the lazy, in other words.